Yes, storing your sheet sets in their own pillow cases is a nice idea, however i'm not sure i'd be able to stretch my care-meter to accommodate the added time it would require for me to make something look that nice. I tried this because I hate looking for matching sheets but it doesn't look that good. It might be because of the contour sheet that is so bulky (I can never fold it perfectly). I with ya. My granny folded sheets like she came from the milatary. Somehow there was a water down effect. My mother doesn't do them as nice as her andmy sheets don't even look as good as my moms. As long as they are laundered I give myself a pass. what a good idea !! Why didn't I think of that !! 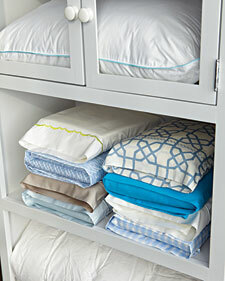 You can fold the fitted sheet by grabbing it by the "corners" at each corner above the elasticized band. These are sewn-in points to the fabric that make it look nice and neat on your mattress. Tuck in the elastic beneath the corner point and fold as you would a regular sheet, folding in so the elastic is inside the fold. The key is to keep the elastic tucked in so you have as close to a rectangle as possible, to make it look neat. The fitted sheet will be folder larger than your flat sheet, so tuck the flat sheet in between the last fold and then stick that into your pillowcase. Voila! mine never look this good....more like Santa's sack....but it is the best way to keep everything together in our large family! I did this! BUT my guest didn't realize that it was a bundle of sheets and used it as a pillow:( I can't tell if this means that I did too good a job making it look smooth and uniform, or if my friend is just a moron.